While doing research at Pacific Northwest National Laboratory and teaching at the University of Washington, Bob Houze saw great potential in strengthening collaborations between the atmospheric sciences departments at both institutions. "We have common objectives but different strengths," said Houze, a PNNL Laboratory Fellow and UW professor emeritus of atmospheric sciences. "There's a history of university departments and national lab departments working well together in an integrated way." Early this fall, one piece of Houze's vision finally became a reality. 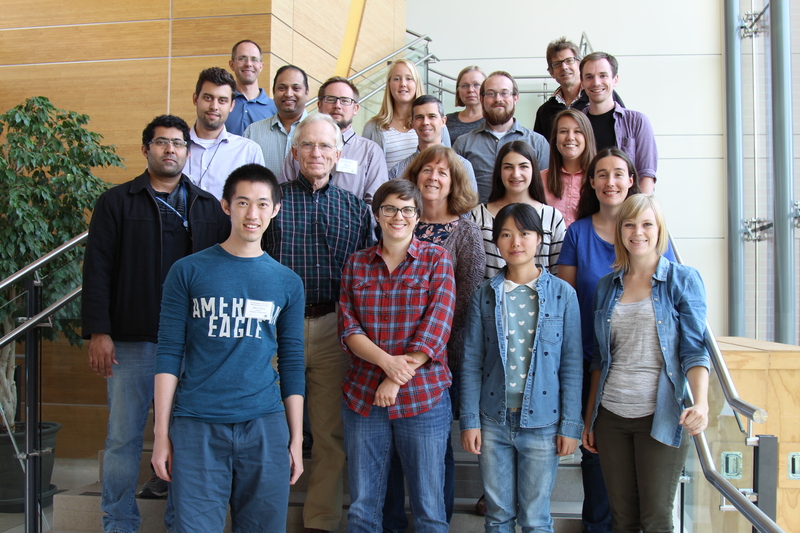 Ten UW students traveled to Richland to take a two-week instrumentation short course taught by PNNL scientists and engineers. 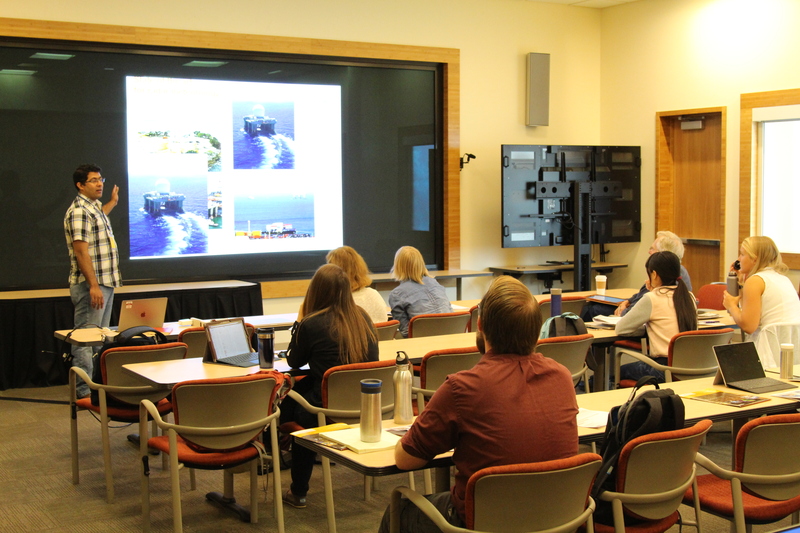 Focusing on themes such as calibration and accuracy, instructors developed lectures on ground and airborne instrumentation and measurements, data management, and atmospheric chemistry and cloud microphysics. 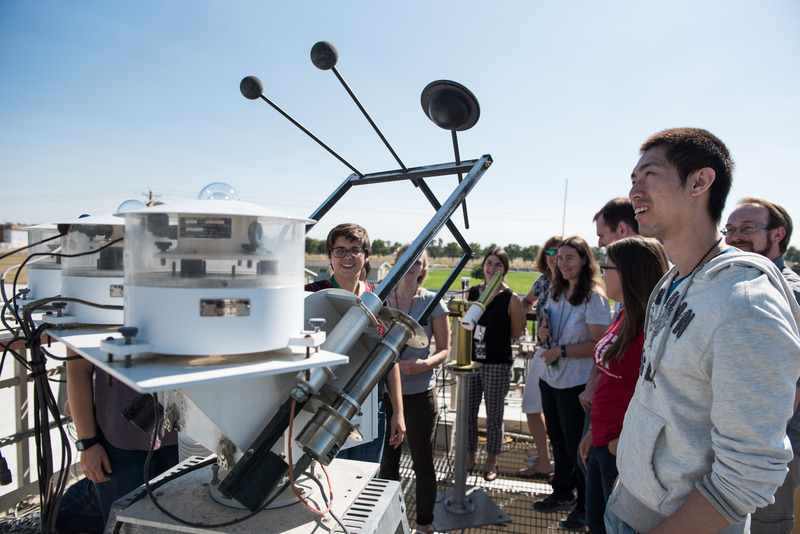 The inaugural PNNL/UW atmospheric research instrumentation class toured the PNNL Atmospheric Measurements Laboratory's "skystand" platform, which includes a group of radiometers measuring solar energy at different angles. The students have wide-ranging areas of study, but they share a desire to learn more about instruments and data that might crop up in their research or future careers. "To actually see the insides of some of these instruments and what goes into obtaining the actual measurement was extremely rewarding," said Robert Conrick, a third-year graduate student focusing on weather model evaluations. When the course announcement went out to UW students last winter, the class filled up overnight. "In our department, we don't have the observation and instrumentation infrastructure for our students to become acquainted with," Houze said. Houze got help organizing the course from Lynn McMurdie, a research associate professor of atmospheric sciences at UW, and Laura Riihimaki, a researcher in PNNL's Atmospheric Sciences & Global Change (ASGC) Division. Riihimaki recruited fellow lab staff members to serve as course instructors and worked with them to map out how the coursework would progress. "I was worried that the instructors would only have time to teach for an hour or two, but the response was great," Riihimaki said. "They were saying, ‘Oh, no, I can't cover this material in less than two days.' "
Instructors chose to reinforce their lectures through experiments, demonstrations, computer analyses, mock field campaign designs, and field trips. Students toured PNNL's Atmospheric Measurements Laboratory, a research facility with instruments used to study aerosols, clouds, and their interactions, and the Gulfstream-1 research aircraft that PNNL operates for the U.S. Department of Energy (DOE). The plane helps collect airborne measurements for field campaigns related to the Atmospheric Radiation Measurement (ARM) Climate Research Facility, a DOE scientific user facility. "We tried to present the students with information that went beyond textbooks and addressed the realities of working with these instruments in a research capacity," radar engineer Joseph Hardin said. "This is important because these students will eventually be our peers and colleagues in the field." Chitra Sivaraman, Krista Gaustad, Sherman Beus, and Ken Burk, data management. PNNL's Nitin Bharadwaj teaches the UW class about research radars. Bharadwaj is the radar engineering lead for the Atmospheric Radiation Measurement (ARM) Climate Research Facility, a U.S. Department of Energy scientific user facility. When Riihimaki planned her lecture on broadband radiometers, she talked with Morris and Sivaraman's team to make sure they were "teaching in the same direction." "I wanted the students to get an idea of the whole end-to-end process from sticking an instrument out in the field to bringing in the data, doing the data quality, looking at what it really means, and then how would you archive it so that people can use it in the future," Riihimaki said. Ian Kraucunas, ASGC division director, kicked off the course with background information about PNNL and the ASGC division, followed by a direct call to action for the students. "Right off the bat, Ian set the tone by demanding us to ask questions," said Megan McKeown, a second-year graduate student who wants to become an air quality consultant. "I think it made us all feel open to have a dialogue with the instructors." Every morning, a pair of students got in front of the class and presented on the previous day's lesson. If the presenters ran into a concept they didn't fully understand, the previous day's instructor was there to explain it in further detail. "That interchange really elevates the learning that the students gain," McMurdie said. Students will receive credit for the course, but the work isn't over. They each have a month and a half to complete a project, designed by the student with one of the course instructors, using PNNL research data and ARM measurements. The students are eager to apply what they've learned out in the field. Second-year graduate student Qiaoyun Peng will get that opportunity when she participates in a National Science Foundation-sponsored field campaign in 2018. The Western Wildfire Experiment for Cloud Chemistry, Aerosol Absorption, and Nitrogen (WE-CAN) will use airborne instrumentation to study atmospheric chemical reactions within Western U.S. wildfire plumes. "I feel much more confident to conduct a field experiment after the course, as I absorbed a lot from the practical experience and theoretical foundations that the PNNL scientists gave us during this intensive two weeks," Peng said. "It's also a great opportunity for me to feel what it is like to work in a national lab and get in touch with top scientists in my field to design a small project together." Eliza Dawson, the only undergraduate who took the class, is more motivated than ever to pursue further study of atmospheric sciences. "I was interested in it beforehand, and I'm still super-interested in it," she said. "This fall, I'm going to be applying for grad school." Those kinds of responses have Houze believing that similar courses could be just as successful in the future, training young scientists who eventually might work at PNNL, UW, and other national labs and universities. "We'd love to do this every two years," Houze said. All of the students finished the class with a greater appreciation for what scientists and engineers do with instrumentation and data. It also opened them up to new career paths to explore. Someday, they could be the ones interpreting signals, installing an instrument on a mountain, or keeping hardware cool in tightly packed quarters. Jessica Haskins, a fourth-year graduate student who uses aircraft instrument data in her research, called the class an "unprecedented opportunity." "This course was by far the one I've learned the most from in graduate school," Haskins said, "and I'm so thankful for the partnership between the UW and PNNL that allowed us to learn from the people who operate, build, and process that data every day." On Sept. 22, PNNL/UW class members and instructors gathered for a photo on the final day of their two-week instrumentation short course.